The Comoros ( IPA: [kəˡmɔːɹəʊz]), officially the Union of the Comoros (French: 'Union des Comores', [ynjɔ̃ de kɔmɔʀ]; Arabic: اتحاد القمر‎, [ʔitːiˡħæːd ælˈqɒmær], and until 2002 the Islamic Federal Republic of the Comoros), is a country in the Indian Ocean, situated at the northern end of the Mozambique Channel between northern Madagascar and northern Mozambique. The country consists of three of the four main islands in the volcanic Comoros archipelago: Grande Comore, Mohéli and Anjouan. The fourth island in the island group, Mayotte, is not part of the country. Mayotte has voted against independence from France, but is claimed by Comoros. The country's territory also encompasses many smaller islands. Its name derives from the Arabic word qamar ("moon"), as seen depicted on its flag. Wikimedia Atlas of Comoros . Over the centuries, the islands of Comoros were populated by a succession of diverse groups from the coast of Africa, the Persian Gulf, Indonesia, and Madagascar. Portuguese explorers visited the archipelago in 1505. Between 1841 and 1912, France established colonial rule and placed the islands under the administration of the governor general of Madagascar. Later, French settlers, French-owned companies, and wealthy Arab merchants established a plantation-based economy that now uses about one-third of the land for export crops. Agreement was reached with France in 1973 for Comoros to become independent in 1978. On July 6, 1975, however, the Comorian parliament passed a resolution declaring independence. The deputies of Mayotte, which stayed under French control, abstained. Ahmed Abdallah became the first president and proclaimed the Comoros' independence on September 5, 1975. The next thirty years were a period of political turmoil. It began in 1975 when a mercenary named Bob Denard under orders from Jacques Foccart forcibly ousted president Ahmed Abdallah from office and replaced him with Ali Soilih. Around that time, in two referendums — December 1974 and February 1976 — the population of Mayotte voted against independence from France (by 63.8% and 99.4% respectively). The three independent islands, ruled by President Solih, instituted a number of socialist and isolationist policies that soon strained relations with France. On May 13, 1978 Bob Denard returned and overthrew President Solih by force and re-instated Abdallah. Unlike Abdallah, Soilih was killed after being forced from office. Abdallah continued as president until 1989 when, fearing a probable coup d'état, he signed a decree ordering the Presidential Guard, led by Bob Denard, to disarm the armed forces. Shortly after the signing of the decree, a military officer allegedly entered president Abdallah's office and fatally shot him, injuring Denard at the same time. A few days later, Bob Denard was evacuated to South Africa by French paratroopers. Said Mohamed Djohar, Soilih's older half-brother, then became president and served until September 1995 when Bob Denard returned and attempted another coup. France intervened with paratroopers and forced Denard to surrender. The French moved Djohar to Reunion and the Paris-backed Mohamed Taki Abdulkarim became president by election. He led the country from 1996 until he died in November 1998. Colonel Azali seized power in a bloodless coup in April 1999, overthrowing the Interim President Tadjiddine Ben Said Massounde. 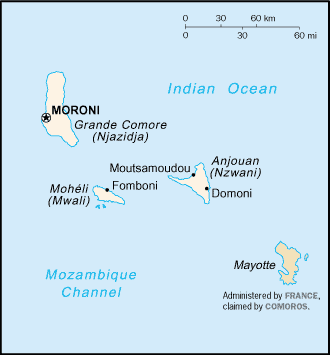 The islands of Anjouan and Mohéli declared their independence from Comoros in 1997. A subsequent attempt by Azali to consolidate power and reestablish control over these islands was the subject of international criticism, and the African Union, under the auspices of President Mbeki of South Africa, intervened to help broker negotiations and effect a reconciliation. This involved a system of governmental autonomy for each island, plus a Union government for the three islands. Azali stepped down in 2002 to run in the democratic election of the President of the Comoro Union, which he won. Under ongoing international pressure, as a military ruler who had originally come to power by force and was not always democratic while in office, Azali led the Union through constitutional changes that enabled new elections. A "Loi des compétences" (a law that defines the responsibilities of each governmental body) was passed in early 2005 and is in the process of implementation. The elections in 2006 were won by Ahmed Abdallah Sambi, a Sunni Muslim Cleric nick-named the "Ayatollah" for his time spent studying Islam in Iran. Azali honored the election results, thus allowing the first-ever peaceful and democratic exchange of power in the archipelagos' recent and turbulent history. Comoros is formed by three of the four main islands in the Comoros Archipelago; the fourth is the French territory of Mayotte. The archipelago is situated in the Indian Ocean, between the African coast and Madagascar. The interior of the volcanic islands varies from steep mountains to low hills. Le Karthala (2,361 m or 7748 ft) on Grand Comore is an active volcano. Politics of the Union of the Comoros takes place in a framework of a federal presidential republic, whereby the President of the Comoros is both head of state and head of government, and of a pluriform multi-party system. Executive power is exercised by the government. Federal legislative power is vested in both the government and parliament. The Comorian legal system rests on Islamic law and an inherited French ( Napoleonic code) legal code. Village elders or civilian courts settle most disputes. The judiciary is independent of the legislative and the executive. The Supreme Court acts as a Constitutional Council in resolving constitutional questions and supervising presidential elections. As High Court of Justice, the Supreme Court also arbitrates in cases where the government is accused of malpractice. The Supreme Court consists of two members selected by the president, two elected by the Federal Assembly, and one by the council of each island. The military resources of the Comoros consist of a small standing army and a 500-member police force, as well as a 500-member defense force. A defense treaty with France provides naval resources for protection of territorial waters, training of Comorian military personnel, and air surveillance. France maintains a small troop presence in Comoros at government request. France maintains a small maritime base and a Foreign Legion Detachment (DLEM) on Mayotte. See also Military of Comoros. In November 1975, Comoros became the 143rd member of the United Nations. The new nation was defined as consisting of the entire archipelago, despite the fact that France maintains control over Mayotte. Comoros also is a member of the Organization of African Unity, the Arab League, the European Development Fund, the World Bank, the International Monetary Fund, the Indian Ocean Commission, and the African Development Bank. See also Foreign relations of Comoros. Comoros is one of the poorest countries in the world. Agriculture, including fishing, hunting, and forestry, is the leading sector of the economy. Comoros has inadequate transportation system, a young and rapidly increasing population, and few natural resources. The low educational level of the labor force contributes to a subsistence level of economic activity, high unemployment, and a heavy dependence on foreign grants and technical assistance. Agriculture contributes 40% to GDP, employs 80% of the labor force, and provides most of the exports. Comoros is the World's largest producer of ylang-ylang, and a large producer of vanilla. The Comorians inhabiting Grande Comore, Anjouan, and Moheli (eighty-six percent of the population) share African-Arab origins. Islam is the dominant religion. Although Arab culture is firmly established throughout the archipelago, a substantial minority of the citizens of Mayotte (the Mahorais) are Roman Catholic and have been strongly influenced by French culture. There are also substantial Indian minority., as well as Creole-speaking minorities mostly descended from Reunionnaise. Chinese peoples are also present on Mayotte. The most common language is Comorian, a Swahili dialect. French, Arabic and Malagasy also are spoken. About fifty-seven percent of the population is literate in the Latin alphabet, more with the Arabic alphabet.